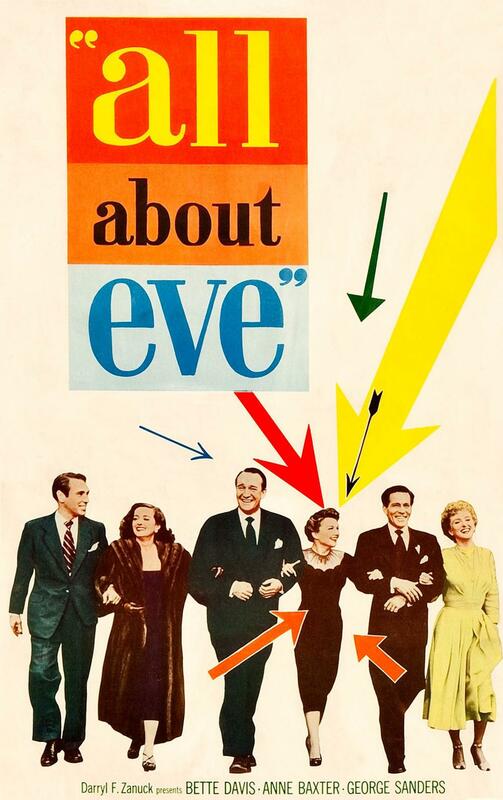 In 1950, two major films dealt in a poignantly satirical way with the world of showbiz: “All About Eve” and “Sunset Boulevard.” Never before had Broadway in “All About Eve” and Hollywood in “Sunset Boulevard” suffered such scathing indictments from their own members. “All About Eve” marked a breech in America’s love affair with Broadway–and the end of Broadway’s golden era. Director Joseph L. Mankiewicz’s unveiled a new image of a corrupt place where actresses slept their way to the top. In the Anne Baxter and George Sanders characters, ruthless people clawing their way upwards, Broadway’s dark side was revealed. Marilyn Monroe, in an early role, calls producers “unhappy rabbits,” a dismissal that’s indicative of the film’s attitude toward the theater. For years, Broadway had maintained the reputation of being a nobler art than cinema, but “All About Eve” ruined Broadway’s fame. As the Hays office loosened up, Hollywood began “stealing” Broadway’s adult subject matter, leaving it without its unique trademark. Aside from attacking Broadway, the film defended Hollywood against the encroachment of television. In one of the great one-liners, Sanders tells Monroe: “That’s all television is, my dear. Nothing but auditions.” “All About Eve” while ostensibly about Broadway, was in actuality an elaborate editorial praising the Hollywood system. The Broadway context, however, pervades every aspect of the film, which is based on Mary Orr’s story and radio play, The Wisdom of Eve. Margo Channing (Bette Davis) has just turned 40 and is insecure about her position as a star. She’s in love with a younger man, a director (Gary Merrill), and is feeling their age difference where it hurts. 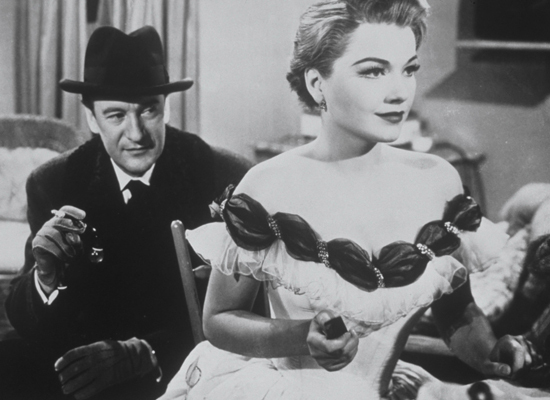 Margo is introduced to a wide-eyed, stage-struck, Eve Harrington (Anne Baxter), who warms her way into her life, becoming a surrogate sister, mother, friend, shrink–and eventually understudy. A schemer, Eve’s eyes are set on taking Margo’s place–and lover. In the end, Margo retires from the stage to married life, and Eve takes on a young girl, who’s just as ambitious as she was. Eve is doomed to suffer retribution from the next generation of ingénues. Mankiewicz’ lines are too witty to reflect a “realistic” speech, but there’s no denying their entertainment value. “Eve would ask Abbott to give her Costello.” “Remind me to tell you about the time I looked into the heart of an artichoke!” “Miss Caswell [Marilyn Monroe] is an actress, a graduate of the Copacabana School of Dramatic Arts.” “Oh, did I say killer I meant champion. I get my boxing terms mixed.” “What a story! Everything but the blood-hounds snappin’ at her rear end!” However, the most memorable lines are in Margo Channing’s speech, which blatantly states how career women were seen in the 1950s–a professional woman becomes a woman only after she’s done with her career! Funny business a woman’s career. The things you drop on you way up the ladder–so you can move faster–you forget you’ll need them again when you go back to being a woman. That’s one career that all females have in common whether we like it or not. Being a woman. Sooner or later we’ve got to work at it, no matter what other careers we’ve had or wanted. 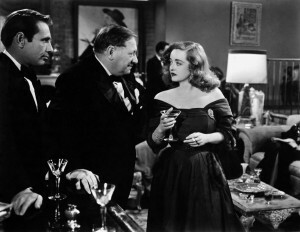 In “All About Eve” there are two images of career women: Davis and Baxter. Davis is the good career woman in traditional Hollywood thinking, she acknowledges the importance of men by eventually getting married and giving up her passionate work. “I’ve finally got a life to live,” she later says, “I have things to do with my nights.” Baxter is the bad career woman, willing to do everything and anything to make it. The film’s sexual politics extend into innuendoes, some ahead of their time. Eve’s lesbianism, which seems clear today, was missed at the time. Baxter’s mannishly cropped hairstyle is a lesbian stereotype, and she’s overly friendly with a pajama-clad roommate. Eve suggests that Phoebe, her younger counterpart, stay the night rather than make the long subway trip home. “All About Eve” was one of the first films to deal with the burgeoning generation gap, which would be fully stated in the l960s. But it was in the l950s that communication breakdown and hatred between generations became apparent. Davis and Baxter represent the growing irreconcilability of different generations that profess opposing values. The record for Oscar nominations, 14, was held by “All About Eve” until James Cameron’s “Titanic,” which also received 14. The film won 6 Oscars, including Best Picture. Mankiewicz won 2 Oscars, as writer (original screenplay) and director, and Sanders won Supporting Oscar as the acerbic drama critic. Its two leading ladies, Davis and Baxter, didn’t win; they probably canceled each other out. Davis did win the N.Y. Film Critics Award.